To convert rotational momentum artificially into linear momentum with my machine, I must first confess that the centrifugal force manipulator is actually a centripetal force manipulator, so lets call it that from now on. that I recorded while the machine was set up for it, producing 0.050 kg pulling power per orbit. The function of the centripetal force manipulator is graphically explained in Fig. 2 above. FIG. 2 shows a GM active diagram, FIG. 3 shows a GM passive diagram. 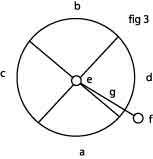 If we divide the shapes into four sectors, a, b, c, d FIG. 2-3, to serve as an explanation. Sector a, represents the centre earth directed gravitational force. Sector b, the fractional opposing force to sector a. Sector c and d are the forces that cancel each other out but they do create a two way lever force by the lever arm g that is negatively involved, in the whole centripetal force manipulation process. 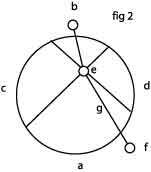 e presents the axis of the weight orbit, f FIG.2, is the weight, this is a GM active orbit. If we consider a, b, c, d in FIG.3, as four equal negative acting forces, they cancel each other in pairs, (a + b = 0) and (c + d = 0). That then, would be considered a passive GM orbit, because the four opposing forces are not radius, velocity and mass manipulated against each other, ending in a wobble. Like an out balance car wheel, creating a 360° equal gyro imbalance vibration, not a 90° two directional GM dominating vibration. If we could follow the manipulation process in the mathematical approximation below! For the machine, we take the weight at FIG. 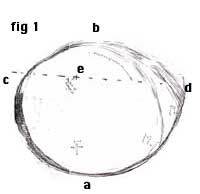 2, as 0.2 kg, the radius a, as 0.1m and radius b, as 0.05 m the weight orbits at 2.5 rev. sec. or 2.5 HZ, GM vibration, and its established power, (2.5 rev. times 0.050 kg/rev.) = 0.125 kgf. Theoretically the force can be taken as a(0.50X) - b(0.25X), in other words, it is a (0.50X) step forward and a (0.25X) step back, equals (0.25X) one directional linear force. the GM vibration frequency between position a - b in FIG.2. Positions c - d in FIG. 2 present d(X-r )  c( X-r) which should be understood as one small step right and one equal step left. This is adding to the vibration pattern also, but it equals zero in one direction, in GM. In this centripetal force manipulation process, by the centripetal force manipulator, there are accelerating and decelerating lever forces influencing the GM (gravitational mechanics) negative, between sector c and d, in FIG.2. As a whole, this above calculation is not an accurate, but purely demonstrative attempt and presents basically only a centripetal manipulation of the radius, see patent application.